1- prepare the profile of the natural inclination of the will to work in the dissolved or whether the owner of the work entrusted to him. 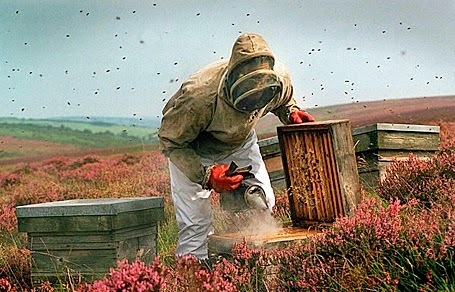 2- do practical training for long enough in a government or civil apiary near the residence of the owner of the dissolved In season bee activity even mastered the various basic beekeeping operations, and all that is in the field of modern beekeeping and resistance to pests and diseases of bees. To gain experience and the experience of being able to gradually expand and increase the number of communities divided in time but if the experience and know-how beekeeping with the availability of the rest of the possibilities available can start raising the desired number of denominations. 4- If the person is an experienced desires to create a promiscuous effectively to engage with him in the work beekeeper intern that gives him a reward rewarding, and it is advisable to be paid in kind at least one third (or quarter) the dissolved the production of honey and wax and packages of bees, as it should be shared His the dissolved with this beekeeper exerciser in all operations so easy for him after adequate training that is all his own operations. 5- The use of one of the experienced technicians and reputed to preview and select the proper place for the establishment of the dissolved and the work necessary planning for the establishment of umbrellas and windbreaks and put the cells as well as to guide the owner of the dissolved and guidance on the necessary tools and places of purchase. 6- fit the amount of food or pasture area with the number required to be established by the communities. 7- that are available in the region, sources of nectar and pollen with sequencing, such as citrus, alfalfa, cotton whenever possible. 8- The source of pure water is available. 9- be the dissolved in easy transportation and desirable place to be away from homes whenever possible in order to avoid problems that may occur with the people, as it should be away from pesticides and places of Funk, ponds, swamps stores. 10- must be planned the dissolved planning Typically so easy to work in. Settle the dissolved own land until the cells can be placed in regular classes and are opening the door of the eastern tribal Ao. Planted windbreaks such as camphor from the Navy and the West to protect it from air currents or Seurat works Ao barrier mats for this purpose. Umbrellas are being worked up appropriately at least 2.25 meters to cover the dissolved during the summer inventory to protect bees from the sun and in the time to explain this limitation can be removed winter to facilitate access to sunlight cells helping on air heating. Hives placed under umbrellas on the dimensions of 0.75 - 13:00 between the cell and the other and it is advisable to be mutual situation with the previous row cells. Good luck and have fun with your own beekeeping adventures!